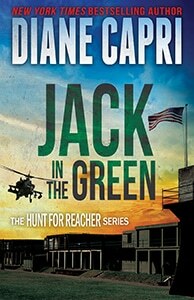 Greed kills as Investigative Reporter Jess Kimball’s impossible mission to protect crime victims continues in this new novel from New York Times and USA Today Bestselling Author Diane Capri. When investigative reporter Jess Kimball’s Taboo Magazine assignment reveals a modern Italian crime family operating inside the US, she joins forces with FBI Special Agent Henry Morris to stop the ruthless killers. Jess rushes against time from Dallas to New Orleans to Florida and New York to find and stop Luigi Ficarra and save the elderly parents of the man he holds hostage. In a chase down to the wire, Jess risks her own life to stop Luigi and the demand that will be fatal. Investigative Journalist and Relentless Advocate Jess Kimball returns in Fatal Demand: A Jess Kimball Thriller available now! 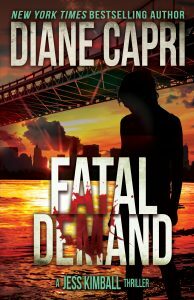 Grab your copy of Fatal Demand: A Jess Kimball Thriller today and get aboard! Readers love Fatal Enemy Jess Kimball! “Thrilling read! Makes you sit up and take notice. She knows how to keep readers reading. Capri has a way with words that’s both captivating and compelling.” C.B. “The setup for the ending had me wondering what was going to happen – right up until it actually did. Great stuff!” N.
“I was caught at the get go and sailed right through, holding my breath at the end.” M.P.